WASHINGTON — Speaking to a ballroom filled with Christian conservatives Thursday, 2016 presidential candidate Ted Cruz reflected on seven of the biggest victories for faith and families achieved since Donald Trump took over the White House in January 2017. 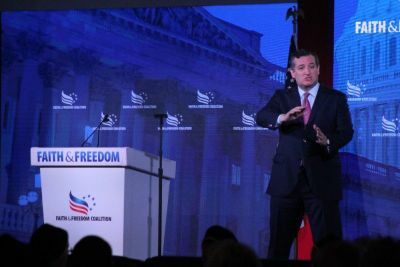 During a luncheon kicking off the annual Road to Majority Conference hosted by the influential social conservative advocacy group Faith & Freedom Coalition, the Texas senator celebrated the conservative political accomplishments of the last year and a half. Cruz, who was the last Republican standing in Trump's way before Trump clinched the Republican nomination in 2016, has played a large role in the slim Republican-majority Senate that, he says, has led to victories for conservatives in addition to what has been accomplished by the Trump administration. The following pages contain the seven "victories" outlined by Cruz during his 25-minute speech at the 2018 Road to Majority Conference.